This was another legacy act at the Warfield accompanied by a strong support band. I like Coheed and Cambria’s recordings a lot, at least the ones I have heard. Their singer amusingly sounds like Geddy Lee and their albums all allegedly form part of some giant comic book story. When performing live the band is led by its two guitarists. I don’t know their story but they look as though they taught each other to play guitar, their left hands move in exactly the same way on the guitar. Unfortunately their live sound is muddy and you can’t understand the singing or distinguish what the two guitarists are doing. I know this wasn’t just his concert as I watched some of their live DVDs as well. This is a case where they should let the singer concentrate on singing and hire another guitarist. They also didn’t seem to like being a support act and the only person who spoke was the bassist. The part of the audience that came for Coheed and Cambria was significantly younger than that for the headliners and there was some serious moshing. 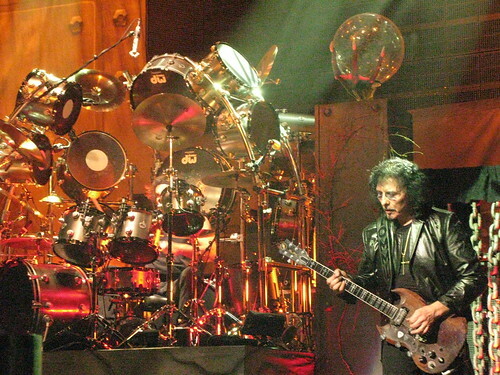 Heaven and Hell is the lineup of Black Sabbath Black that existed between 1980-1982 and 1991-1992. There have been some legal issues with the Black Sabbath name and so the band is touring under this moniker. So far so good, but they have made the foolish mistake of only playing Black Sabbath songs of their own era, ignoring the classic Ozzy stuff. Still, when they appear there is a lot of excitement, and many devil horns are thrust. 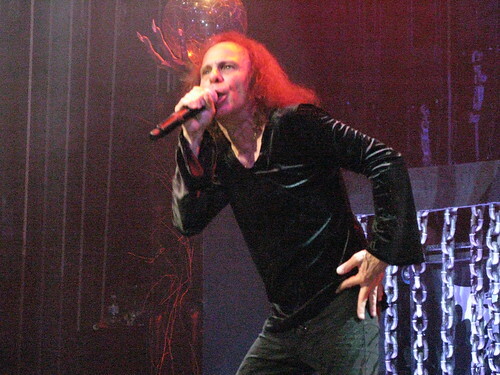 Singer Ronnie James Dio has one of the classic voices of Heavy Metal. He looks great too, jumping around and grinning. He is careful to ration his screams, and his song introductions are a little verbose, I’m not sure we really needed to be told that their performance of a sing about the end of the world would not actually signal said event. Sabbath main man Tony Iommi also looks fabulous, sporting a satanic beard and blue tinted spectacles. I am pleased to see the man who is indirectly responsible for SunnO))) and all those other droney metal bands. Geezer Butler has also been at the hair dye, and is here too, along with Vinny Appice, who has the most ridiculous drum kit. The new songs aren’t bad, but it is when they play their few older songs that this band generates quite a power. Overall this concert was a bit of a disappointment. Both bands could do better, maybe their adoring fans prevent them from seeking to improve. As at many metal shows the audience was surprisingly friendly, really they were the best part of this show. I don't mean to sound rude I stumbled upon s blog accidentally and feel coheed is one of the best live bands in exsistance! ive seen them at the warfield too 10/2008. coheed is awesome and very talented Claudio playing guitar behind his back and with his teeth epic.